We’ve had pets over the years, but decided before Aly was born that we’d have no more pets, so we found new homes for our two cats, had a baby, and life was grand. Our house isn’t huge to begin with, and we’ve got several people in the house who seem to have allergies to pet dander, plus we like to relax at home and already feel like having a house means we have to spend more time at home not relaxing than we’d prefer. Take that, sentence structure and coherence! We actually almost got a dog a few years before Aly was born, but we decided that we’d have a kid instead. Of course that means that we been subjected to nearly seven years of “Dad, when can we get a pet?” Typically a dog is requested, occasionally a cat or a rabbit. My answer has always been “Nope. I’m not willing to do the work and I don’t think you’re ready for the responsibility,” in a tone of voice that does not encourage further discussion. We usually try to converse with our kids at a level that treats them with respect and promotes logical thought, but not on this one. One afternoon in February, Leah and I were outside when Rachel and Aly arrived home and parked in our snowy driveway (we had gotten about four inches of fresh snow that day). Aly was excited about the snow and started winging snowballs at the rest of the family. Rachel was carrying some bags in her right hand, so she scooped up a snowball and threw it weakly at Aly, prompting ridicule from this author. A few more snowballs were tossed, then we went inside, put away the groceries and got settled. About thirty minutes later, Rachel realized she no longer had a wedding ring on her left hand. As panic ensued, Rachel checked her pockets, her mittens, the shopping bags, her coat and her car, before calling the two stores they had visited. I spent an hour using the kids’ snow shovel to peel away the top inch or two of snow covering the entire area behind our cars and along the sides of the driveway, carefully scanning for shiny bits among the snow. The forecast called for rain to start in the early evening before turning to heavy snow overnight. I felt like the window to find the ring was closing quickly, because our plow guy would definitely be coming in the morning to clear the predicted snowfall, which would greatly expand the search area. I chipped away at the snowpack with no luck and headed inside to eat dinner. The rain started shortly after dinner, which I felt was an advantage because it would start to clear away some of the snowpack. Of course, being February, daylight hours are short, especially on rainy days, so I had to use my car’s headlights to illuminate the driveway while I chipped away in the rain. I moved the car every ten minutes or so, chipped some more, then repeated the process, eventually giving up after another hour or so, thoroughly soaked. We spent quite a bit of time trying to replay the ring tossing in our minds and figure out where the ring likely lay, but went to bed without any sign of the ring. Aly: Daddy, are we going to buy Mommy a new ring? Me: Yes, we might have to do that. Aly: [long pause] Maaaannnnnnn, that would cost like five hundred dollars! This is Aly’s second year at Black River Public School, and they have a carnival night every spring – Aly loved it last year and was very excited about going to her second carnival. We had surprised her last year by sponsoring a game in her name, which blew her away when she came upon the sign, so we did it again this year. She also told us that she was “super excited” because she’d heard that this year’s prizes included “real goldfish!” which of course set off my uh-oh meter but nothing that some Xanax couldn’t handle. I had spent many hours over the weeks between the ring tossing the carnival trying to find the ring, as did Rachel and the girls. I chipped away at the driveway ice, breaking through sections that were three inches thick, chopping those up smaller, and then shoveling those chunks into a single pile off the driveway. We pay for a plow service, but put in many hard hours this year shoveling our driveway that left my back sore for several weeks – I had to use a tamper as an axe to break up the ice and that thing is hefty. We arrived a couple minutes early and headed right for the goldfish game, as Aly was “super excited” and wanted that to be her first game. The games are all in the classrooms, and the goldfish game had three long tables pushed together against the far wall of the room nearest the windows. In the middle of the tables were three fish bowls, targets for the puffy ball thrown from several feet away from the tables. One ticket granted three throws, and landing the fluffy ball thing in any of the bowls won the thrower a plastic goldfish that could be exchanged for the real thing. Aly needed only four of the six throws to snag her first two pets, and her other two throws were not even close to the table, let alone the fish bowls. Seriously, what are the chances? Plastic fish in hand, we continued through the remainder of the carnival games, which both kids enjoyed. Aly loved the “Potty Toss” and kept hitting winners all night long – people kept saying “you should take her to buy lottery tickets!” Leah loved to pick ducks and try to steal the balloon decorations, and we ate the pizza standing up because the few tables were occupied by other families. When it was time to leave, Aly picked out her two goldfish and we headed home, with an overtired Leah serenading us for the entire 3-minute ride home. Aly was absolutely tickled to be holding the bagged fish on her lap and quickly announced the names of her fish, which she referred to as my “grandfish.” I spent a few minutes googling things like “how long can a goldfish live in a bag” and quickly realized that we were going to Meijer that night, despite the fact that it was nearly 9pm. Aly and I headed to the store and bought a 5-gallon tank (low commitment, the fish people on the web say that comet goldfish eventually need 75-gallon tanks!) and all the usual accessories: gravel, filter, bubbler and Aly picked out the accoutrements so that they fish wouldn’t live boring lives. It took a while to get the whole setup together on the kitchen counter, then we had to let the water temperature equalize before letting the two fish loose in their new home. It was nearly 11pm by the time we let them swim in, but at least it was a Friday night and not a school night for Aly. Keira and Miya seemed happy to explore their new surroundings so we finally headed off to bed. Aly actually took it pretty well for her first experience with death. 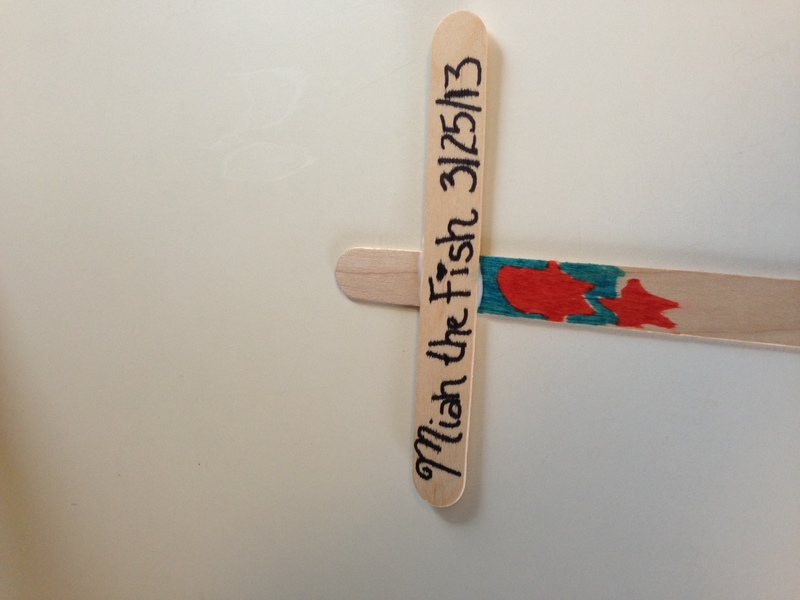 Rachel wisely suggested that we wait until the end of the week before getting the replacement fish, just in case something happened to the surviving fish. When I got home, I consoled Aly as best I could, ate a quick dinner and then told Aly I had to run outside to close the garage door. She was already in her pajamas but asked if she could join me outside and show me where her fish was buried. I of course agreed, so we headed out into the twilight of our backyard. We walked over to the spot in the garden where she had buried her fish, and I said some things about it being okay to be sad, and she replied with something about fish heaven. I said “it’s getting late, so I’m going to go close the garage and we’ll get you up to bed.” I walked across the backyard towards the garage, and that’s when I saw it. The ring. I stopped just short of it and called Aly to my side then asked her to look down by my feet, where she got giddy when she spotted the ring. One month had passed since the ring had been lost, and it was found where one of my ice piles was, but also fairly near where Rachel had scooped up the snow. Aly asked if she could be the one to show Rachel that we found the ring, and I agreed, sending her off to bed with the ring on one of her fingers. When Rachel went into Aly’s room to tuck her in, Aly showed her what we had found, telling her that we had lost something which led to finding something. 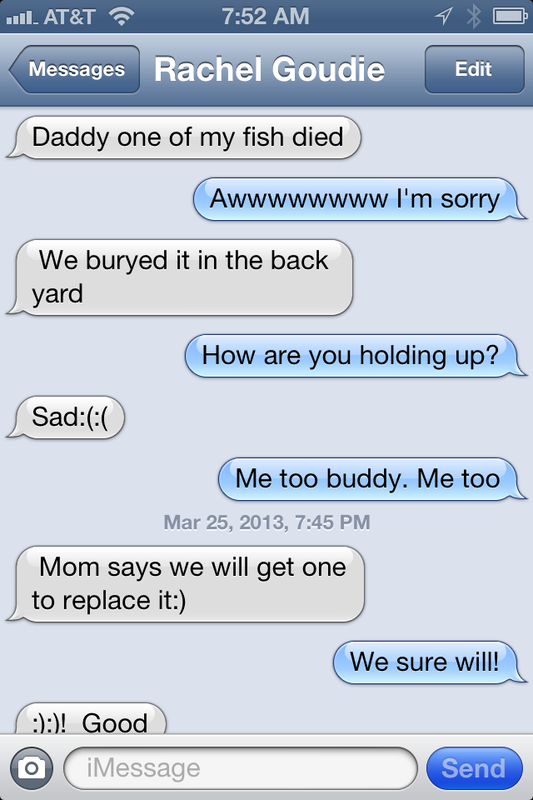 So one dead goldfish, retail price probably 11 cents, saved us the five hundred dollars that a new ring would have cost. Apparently that fish is also worth two thousand words.